HOK worked with Google to design a new workplace stacked over five floors at 111 Richmond Street West, a heritage building in Toronto’s downtown core. Google Canada’s headquarters workplace provides an environment that sparks the imagination while being anchored with well-designed ergonomic spaces and seamless integration of technology. Google’s tagline for the design – “Elegant Garage” – refers to the creative use of simple, inexpensive materials in this beautifully restored building. The office features the work of local artists and includes many Canadian cultural references. Environmental graphics refer to architecture and streetcar tracks, wheat fields and tractors, mountains and fauna, as well as snow drifts with snow shoes. With help from Google Maps, the graphics in the stairwells take Canadian cross-country trips. This is the first Google office to have a real miniature golf course. Located on the patio of the full-service café, the golf course’s theme relates to the city’s landmarks. Other unique features include cabin booths, a retro record player lounge, table tennis lounge, fitness facility, liquid galaxy display, camping lounge, massage room, billiards room, Tech Talk, fireplace lounge, grassy knoll lounge and Rubik’s cube art. A library lounge leads into a secret room. To support Google’s commitment to sustainable practices and desire to occupy the most environmentally responsible office in Toronto, the team is working toward LEED Gold certification. The carpeting is made from recycled fishing line harvested from the ocean floor, and one micro-kitchen includes a partition wall made from orphaned bicycle parts. 58,000 sq. ft. / 5,390 sq. 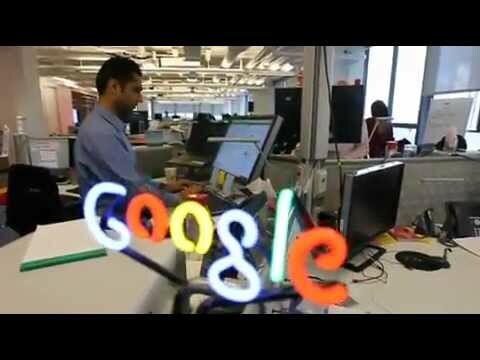 m.
Take a video tour of Google Canada’s Toronto office.